The global carbon fiber reinforced plastics (CFRP) market is expected to register a moderate growth during the forecast period (2018 - 2023). In 2017, North America was estimated to have the highest market share, followed by Asia-Pacific and Europe. Growing environmental concerns, due to the increasing amounts of exhaust emissions, are consistently putting pressure on automobile manufacturers to manufacture vehicles that are fuel-efficient, thereby, minimizing the exhaust emissions. Light-weight materials and designs have become an important aspect in the design and manufacture of automobiles in recent times. In addition, the shifting focus of the governments across the world toward minimizing carbon emissions and enhancing the fuel economy of the vehicle has increased the importance of lightweight materials in the production of automobiles. Hence, the rising demand for light-weight vehicles is driving the studied market over the forecast period. Thermoset resins are made of polymers that cross-link together during the curing procedure of carbon fiber to formulate an irreversible chemical bond at high temperatures. 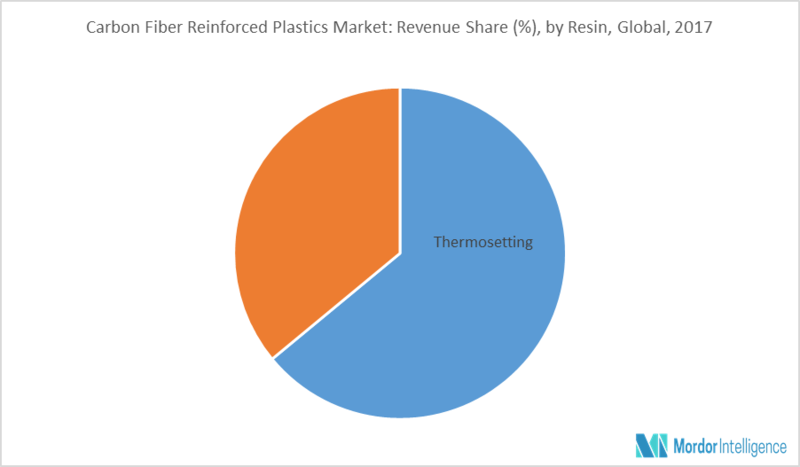 In 2017, the thermosetting CFRPs segment dominated the market for carbon fiber reinforced plastics and accounted for the largest global market share. CFRPs with thermoset resins offer improved temperature resistance, strength, rigidity, and greater performance at high temperature. Thermosetting CFRPs are highly used in end-user industries such as aerospace, automobiles, building & construction, and wind-power industry. However, these industries are focusing more on developing carbon fiber reinforced thermoplastics than on thermosetting plastics, due to their advantageous properties. The growing demand for thermosetting CFRPs in end-user industries across the world is a primary driver for the demand and consumption of carbon fiber reinforced plastics during the forecast period. North America dominated the global carbon fiber reinforced plastics market in 2017. The demand for CFRP is the region is mainly due to growing end-user industries. CFRPs are extensively used in major end-user industries in the region, such as aerospace, wind power, building & construction, and automotive. CFRP is considered to be a key ingredient in numerous areas of the automobile industry. The enactment of fuel economy norms has led the automobile manufacturers to using CFRP in the manufacturing of vehicles in place of steel and aluminum components and body. In addition, many automotive companies are expanding their production plants in countries, including the United States, Canada, and Mexico. Therefore, the demand for CFRP in North America is expected to grow during the forecast period. October 2017: Hexcel Corporation completed the acquisition of Structil SA, a French manufacturer and supplier of high-performance composites to the aerospace, defense, and industrial markets. December 2017: Hexcel acquired the Oxford Performance Material’s aerospace & defense Business. Major Players: Cytec Solvay Group, Toray Industries Inc., Formosa Plastics Corporation, Hexcel Corporation, and Mitsubishi Rayon Co. Ltd, among others. Insights on the major countries/regions in which the industry is growing and to identify the regions that are still untapped. 9.1.8 Nippon Graphite Fiber Corp.
9.2.1 Allred & Associates Inc.
9.2.4 Elite Carbon Fiber Ltd.